Beyond fixing any existing drinking problem, the court’s goal in a 1st offense OWI (Operating While Intoxicated) case is also to prevent a potential problem from developing, or at least developing any further. Because of my formal clinical training, I can say that, unfortunately, the ability of the court system to do this trails well behind the value of its intentions. To put it another way, this all sounds like a good idea, but nobody really knows how to do fix a drinking problem a person doesn’t think he or she has in the first place. The conclusion here is simple: if you are facing a DUI, you are part of an “at-risk” group. To be sure, most 1st offense DUI cases are exceptions for the person in it. Most of these driver’s don’t have any kind of drinking problem and will never get in trouble again, but more than normal DO have issues, or potential issues, and the court system is the first line of defense to detect and try and do something about that. This explains why, when someone in a DUI case has any kind of prior history of laying off the booze for a while, only to start drinking again, and then winds up arrested for drunk driving, it is assumed that he or she has a problem. The court, for its part, is going to focus on how far along it has gotten, and what should be done to “fix” it. If you only drank twice in your life, and got busted for DUI’s each time, then your drinking causes problems, and therefore is a problem. In the real world, once a person has to start thinking about controlling or limiting or managing his or her drinking, it has almost certainly already become a problem. Nobody stops drinking because it’s working out so well. With the exception of being in the military and getting stationed somewhere where alcohol is forbidden, if a person who has abstained because of something like a court order picks up again and finds themselves back in trouble, that’s a clear sign that something is wrong. Whatever he or she may call it, the truth is that the person has relapsed, meaning lapsed back into problematic drinking behavior. 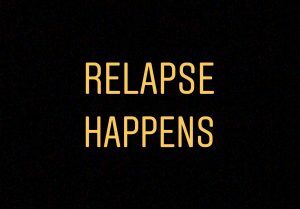 And that really brings us to the grand takeaway from this article: if you’ve stopped drinking for any length of time and then gone back to it, any you characterize that as a “relapse,” then you probably understand sobriety. On the other hand, if you think you can go back to drinking because, somehow, things are or will be “different,” then you’re not there yet. That’s not a bad thing, because getting sober is a process. Quitting for a while and then slipping up and drinking again is often part of that process. It’s when a person cannot deny, even to him or herself, that drinking again is, in fact, a relapse, that his or her understanding of sobriety has progressed to meaningful level. That, in and of itself, doesn’t mean that he or she will never drink again, but it does mean that he or she will never drink again and think it’s okay, and that’s huge. Better than a person quit 11 times for someone else, and then finally quits the 12th time for him or herself, then never quit at all. Putting the plug in the jug for good is the first step to a new and better life for anyone whose drinking has become an issue. No matter where you live, if you are looking for a lawyer to win back your Michigan driver’s license or obtain the clearance of a Michigan hold on your driving record, we can get you back on the road. I guarantee to win to win every license case I take, but I also require that my client has honestly stopped drinking. Even if you haven’t, though, we’ll be glad to speak with you so that maybe we can help you tip the scales in favor of finally putting the plug in the jug so that, at some point in the future, you can put a valid license back into your wallet. If you’re facing a DUI charge anywhere in Oakland, Macomb or Wayne County, we can produce the very best results possible. Beyond just being excellent lawyer, my team and I really care about what we do, and are here to do more than just grab your money and stand next to you. In DUI cases, we provide more than just legal representation; we’re here to help you, as a person, as well. Having completed a post-graduate program of addiction studies, I can protect you from getting forced into unnecessary rehab and/or treatment, or into anything else that’s not a good fit for you. Because of that clinical background, we can talk about your relationship to drinking without judgment and under the protection of the attorney-client privilege. Ultimately, I want to help find the kind of counseling that’s right for you, and otherwise keep you out of any programs you don’t need. Do your homework as you look for a lawyer. Read around, then check around. Become an educated consumer. When you’re ready, give my office a ring. All of my consultations are done over the phone, right when you call. You can reach my office Monday through Friday, from 8:30 a.m. until 5:00 p.m. (EST) at 586-465-1980. We’re really friendly people who will be glad to answer your questions and explain things. We’re here to help.